Complete conversion kit to electrify Worksman 20" Front Wheel Heavy Duty Trikes (Mover Trikes with 20" Front Wheels, and all Side by Sides and PAV series) Kit includes fork with wheel installed and caliper brake to fit 20" Worksman Trikes, charger and battery. 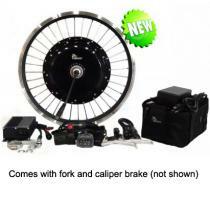 Electric Kit to convert 20" Front Wheel Worksman Heavy Duty Tricycles to Electric versions. Getting the electric aftermarket kit for my bike was a move I will never regret. I was able to install it with no professional help. It's great to get that boost when you're going uphill or against the wind. Very enjoyable and really puts more fun into riding the bike. The E-BIKE unit went on to our side by side with no problems. The E-BIKE is just what we needed for our disabled child. She now can go on family bike rides with ease and can go much greater distances.